Cats have staring contests with each other to establish and maintain authority. So who rules the roost when you aren't around? It's usually easy to pick out the dominant dog in a pack, but hierarchy among cats is a bit more convoluted. Felines employ various tactics to maintain dominance over other cats, and may turn to violence as a last resort. Cats assert themselves by threatening other cats with their posture and attitude. Displays of aggression between pets may seem completely unnecessary to the owner, but they're an important part of feline social interaction. Cats struggling for dominance often assume an aggressive stance around each other. They arch their backs or actively stalk each other, according to the Ohio State University College of Veterinary Medicine. Of course, plenty of growling and hissing is involved in feline disputes as well. 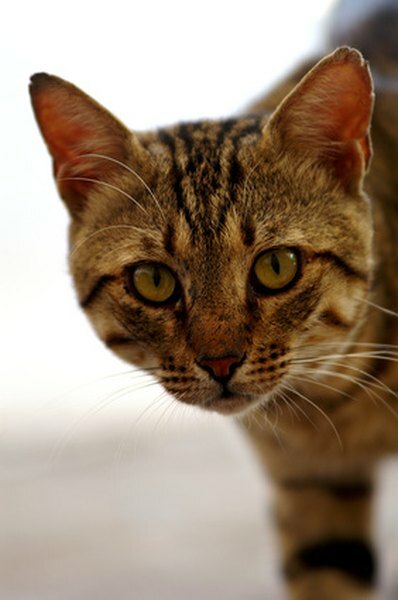 All cats have special glands that produce scents (pungent to each other) that they use to mark their territory. When a cat is attempting to assert his dominance, he will frequently rub his cheeks against objects, people and animals to create scent markings. The scent produced by these glands smells the same to humans no matter which cat produced it, but your pets can tell who made a particular marking. When two cats struggle for dominance, each will mark areas that the other one has already marked. Both male and female cats can also release an potent, foul-smelling scent from their groins, a process called "spraying," which can be mistaken for urination. When a cat displays aggressive behavior, or if his "victim" feels threatened, the two may engage in violent combat. If the two cats are familiar with one another, they may simply try to pin each other down rather than cause bodily harm, but this is not always the case. In a dominance struggle, each cat attempts to position herself above the other and may nip at the neck or belly of her captive. Cat fights are often very loud, as both cats scream, hiss and growl throughout the altercation. Cat claws are sharp, so howls of pain are commonplace as well. Fierce competition over food, water and attention can be a cause or symptom of feline dominance struggles. The food bowl is likely the prime place for a kitty showdown, so feeding your cats separately is a simple way to reduce the chances of conflict between your pets. Give your cats treats, attention and catnip separately to prevent them from feeling that their survival and happiness is reliant on "beating" each other to the good stuff.